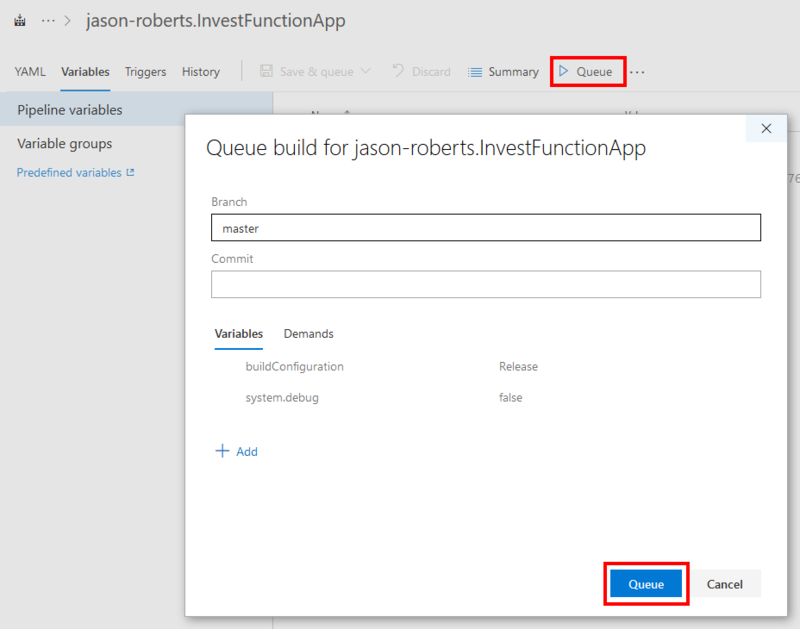 This is the fourth part in a series demonstrating how to setup continuous deployment of an Azure Functions App using Azure DevOps build and release pipelines. In the previous instalment we created a build pipeline, defined the build steps using YAML, but when we tried to execute the build, it failed with the error:”buildConfiguration: command not found”. This is because in the YAML build definition we are referencing the $(buildConfiguration) variable which has not yet been defined. 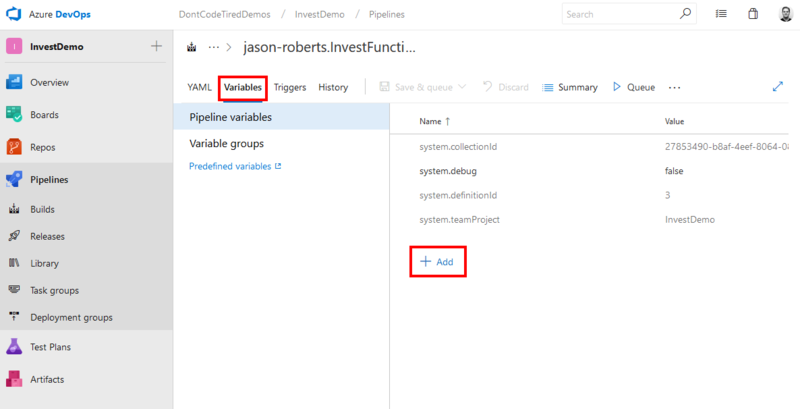 Essentially variables allow you to define key/value pairs that can be used throughout the pipeline. 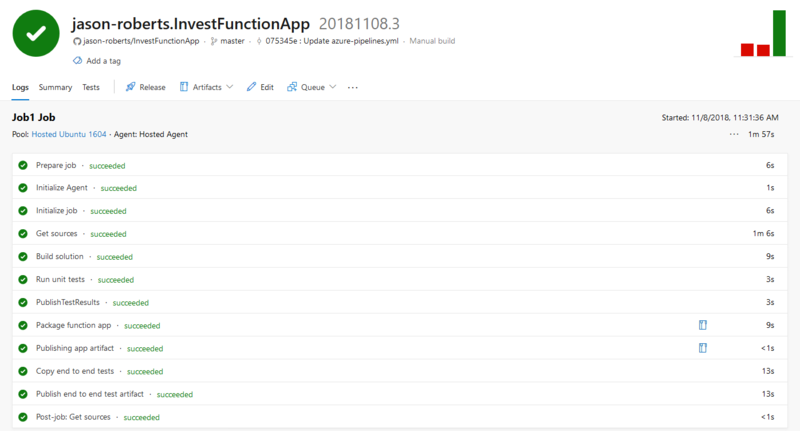 They can be passed to YAML build definitions for use in steps, they can be accessed as environment variables in scrips and from unit tests, and can be used in the pipeline GUI when configuring tasks. There are a whole host of predefined variables such as Agent.JobStatus, Build.BuildNumber, System.PullRequest.PullRequestId, etc. You can also create your own custom variables. Another nice thing about designating a value as sensitive is that it will also be redacted in log messages produced by Azure Pipelines. Sensitive variables can also be passed to scripts – you should read the documentation and be careful about any custom logging or other output you create as you may inadvertently reveal secrets. And this will take you to the build that should start executing. Also notice that the steps in the build from “Build solution” to “Publish end to end test artifact” correspond to the steps defined in the YAML and that these are set using displayName: 'Run unit tests'. 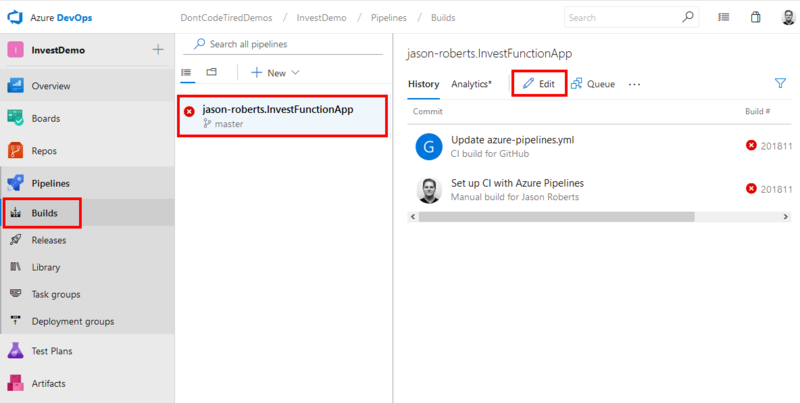 In the next instalment of this series we’ll look at how unit tests are executed as part of the build pipeline.